A series of weaker, warmer storms are headed our way that will bring snow to most of the Sierra and rain to the valleys. The big question is how much snow? My answer is: A lot. First allow me my disclaimer, the models are all over the place, there is serious moisture available for any storms headed our way and there are several storms poised to hit. This will stick with us for some time as the pattern is very wet. Look for snow or snow showers all the way up to the 24th. 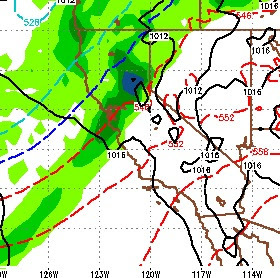 At that time a larger storm comes in and has great potential for really hitting Tahoe on Christmas Eve or thereabouts. Notice the moisture tap for Central and Southern California. I mentioned in my last post that we are starting to show signs of an El Nino pattern and it looks like the beginning may be upon us. 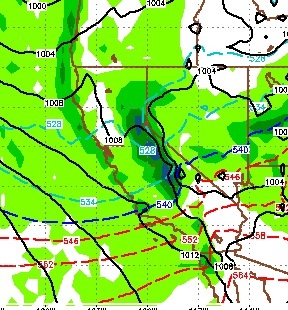 The models are showing precipitation for Southern California to start picking up. 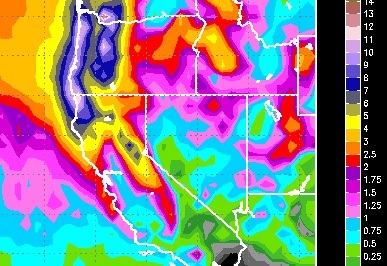 This is showing 8-9 inches of precip for the Sierra Crest, north and west of Tahoe. It is also showing 4-5 inches for the Carson Range. Although our pattern is turning El Nino, which means much warmer, more persistent storms, we could still see 3-4 feet of snow at Mt. Rose in the next 10 days. We could also see much more as this weather pattern is very fluid and moisture rich. If any of these storms strengthens and moves just slightly south, then that amount could increase dramatically.